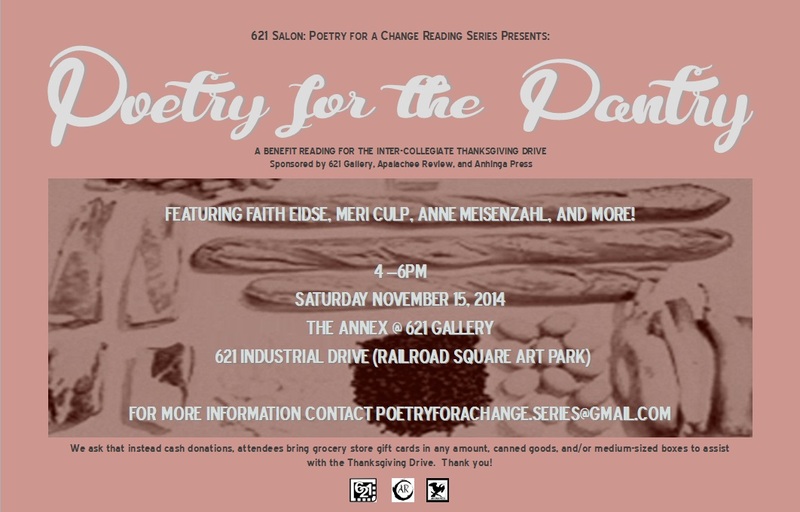 Please join us for Poetry for the Pantry presented by 621 Salon: Poetry for a Change Reading Series. This is a joint project with a local food drive run by Mr. Ray Bellamy for more than twenty years. Readers will include Meri Cup, Anne Meisenzahl, Faith Eidse, and more! Instead of cash donations please bring grocery store gift cards in any amount, canned goods, and/or medium sized boxes to assist with the Thanksgiving Drive. The event will be held on November 15, 2014; 4 -6 pm at the 621 Gallery Annex, right next door to 621 Gallery (621 Industrial Drive Tallahassee, FL 32310).